Provide comfort for the family of Daniel Ahler with a meaningful gesture of sympathy. Daniel “Dan” Blane Ahler, 57, of Lake Geneva, WI was called home unexpectedly to the Lord on Friday, April 5, 2019 at his residence. Dan is survived by his son, Richard of Eau Claire, WI, Mother Rita, brothers: Tim (Jamie) of Huntington, WV and Jerry (Amy) of Algonquin, IL, nieces Rissa, BreAnna and Alyssa: nephews Justin, Kevin and John, grandchild Ronnie, other relatives and many friends. Dan is predeceased by his father, Vince. Dan was born and raised on the family farm between Lake Geneva and Lyons, WI. It was there that Dan learned the value of hard work and creativity while working with his hands and mind. This skill set carried Dan through his life as he became an entrepreneur and valued employee to all that he served with his knowledge and craftsmanship. An avid golfer and Packer fan, Dan was a friend to all that he met. Commonly known as one to “give his shirt off his back” to his friends and family, he was loved by many and admired by even more. He enjoyed travel and spending time in the warm south during our cold winters, and he created many memorable adventures with his friends while vacationing. Dan’s departure has left a hole in many hearts and he will be fondly remembered by young and old alike. A visitation will be held from 11 a.m. to 1 p.m. on Friday, April 12, 2019 at the Steinke-Lazarczyk Family Funeral Home (515 Center Street, Lake Geneva) with a service at 1 p.m. Internment will follow the service at the St. Joseph’s Cemetery in Lyons, WI. Steinke-Lazarczyk Family Funeral Home and Cremation Services of Lake Geneva, WI is proudly serving the family. 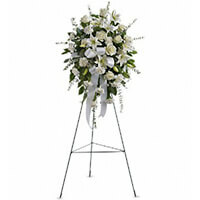 To send flowers in memory of Daniel B. Ahler, please visit our Heartfelt Sympathies Store. The Bernstein Family sent flowers to the family of Daniel B. Ahler. The Bernstein Family purchased the Sentiments of Serenity Spray for the family of Daniel Ahler. We are shocked and heart broke Dan has left us to soon! Dan and Duked worked together many many years. Dan is not only a friend but a part of our family! He will be forever missed! Duke and are are sad we will not be able to attend, as Duke is scheduled for his own health appts at that time. Love and prayers to the family.